John Flamsteed was born on August 19, 1646 in Denby, in Darbyshire, England. His father Steven Flamsteed was the wealthy owner of a mating business. His mother, Mary, died soon after he was born. 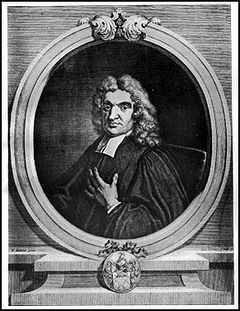 Flamsteed was educated at the Darby Free School but due to his rheumatic disease Flamsteed's father decided not to send him to a university. Instead Flamsteed, who was fluent in Latin, studied on his own learning astronomy from books. Another reason his father did not send him to the university was so that Flamsteed could keep his house and labor in his malt business. Because of this Flamsteed bore a lifelong resentment toward his father. In 1661 He observed his first partial solar eclipse. Eventually Flamsteed was able to enroll at Jesus College, Cambridge, but he was only in residence for two months in 1674 and he received his MA by royal warrant also in 1674. He began corresponding with Henry Oldenburg and John Collins. These two arranged for Flamsteed to meet Jonas Moore, whom he met on a visit to the Royal Society in London in 1670. In 1675 Flamsteed visited London and with the help of Moore was able to get an audience with king Charles II. Flamsteed had won the favor of the king by building a barometer for him the previous year. Charles II appointed Flamsteed his Royal Astronomer. Greenwich Observatory was built for his observations and he began observing there in 1676. Flamsteed was a careful observer and his project was to observe and catalog the locations of the stars. Over the forty years of his project he cataloged the positions of 3000 stars. Flamsteed was a meticulous worker and did not want to publish any results until they all were checked. Isaac Newton became impatient for the results of the catalog and obtained a pirated copy of the work, which he and Edmund Hally published. Flamsteed was so angry at this that he obtained 300 of the 400 copies that were printed and burned them. Because of this Flamsteed came to view Newton and Halley as his enemies. The finished catalog was not published until 1725. Other accomplishments credited to Flamesteed include accurate predictions of the solar eclipses of 1666 and 1668 and the invention of the conical projection which is used in cartography. Even before his visit to London and appointment to become the first astronomer royal, Flamsteed had been ordained and he served as a parish priest in Burstow, Surrey. Honors won by Flamsteed include election to the Royal Society in 1677 and a crater on the moon and an asteroid named after him. Flamsteed died on December 31, 1719 and he was replaced as astronomer royal by his enemy Edmund Hally.